by M. K. Hughes, P. M. Kelly, J. R. Pilcher, LaMarche, Jr., V. C.
The impact of climatic change on human affairs has been demonstrated dramatically in past years. Climatic extremes have placed increasing pressure on world food supplies leading to a doubling, then trebling, of grain prices during the 1970s. Moreover, there is mounting concern that society itself may soon bring about an unparalleled climatic shift by atmospheric pollution and changing land use. In order to deal wisely with the Earth's limited natural resources and to assess society's potential to alter future climate, more information is needed about the course of past climatic change. 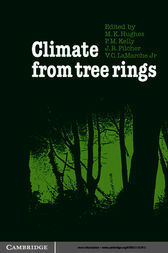 Climate from Tree Rings brings together basic accounts of the methodology, techniques, available data and potential of dendroclimatology, the reconstruction of past climates from tree rings. The material presented in this volume, first published in 1982, represents a major step in the reconstruction of the past climatic record. It will be of particular interest to research workers, postgraduates, and advanced graduates in many branches of the atmospheric, earth and life sciences, especially those with an interest in climatic change and palaeoenviornments.